Be the first to share your favorite memory, photo or story of Paget. This memorial page is dedicated for family, friends and future generations to celebrate the life of their loved one. 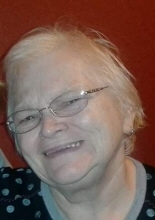 PEORIA – Paget A. Weber, 69, of Peoria, died at 10:01 a.m. on Wednesday, January 23, 2019, at OSF St. Francis Medical Center in Peoria. Paget was born on July 9, 1949, in Peoria to John “Jack” and Florence (Bowen) Sleeth, both have preceded her in death. She married James E. Weber, Jr. on February 22, 1972, in Peoria. She is survived by her husband, James, Jr. of Peoria; her daughter, Chantel (Tammy) Meyer of Dallas, GA; her son, James E. (Mary) Weber, III, of Fayetteville, AR; 6 grandchildren; and two sisters, Angela Anliker of Pekin, and Jackie Reyes of Sun City, AZ. Paget worked for District 150 in the cafeteria at Woodrow Wilson Elementary School and was a babysitter for many years. Cremation rites have been accorded. A memorial service will be held at a later date. "Email Address" would like to share the life celebration of Paget A. Weber. Click on the "link" to go to share a favorite memory or leave a condolence message for the family.